THE EXCRUCIATUS--Ex-crew-see-ah-tus: This is an ancient Latin word for "the pain from the crucified one" (excruciating). Literally, it says "out of the crucified," and thus calls to mind a similar Latin phrase construction: "ex cathedra," which means "the expression [words] coming from [or out of] the [papal] chair." Many of you will recall our in-depth study entitled, "The Crucifixion" [CH--1]. That study revealed something of the terribleness of the crucifixion that Jesus Christ, our Lord and Saviour, underwent on our behalf. But you now have in hand a study that will open up before your eyes even more of the horror of the experience. And as you read it realize moment-by-moment that He went through it all for you. He died that you might be for given of your sins, empowered to obey His Father's law, and live with Him forever at His Second Coming. Additional copies of the study on the next several pages may be obtained from the Department of Pathology, Mayo Clinic, Rochester, MN 55905. THE PAX ROMANA--For centuries Rome ruled the western civilized world with a grip that seemingly defied insurrection. It was not only the Roman talent for government that imposed this strict "peace of Rome"; it was the presence of the cross that solidified it daily in the minds of the people: "Rebel, and we will nail you onto the most terrible form of death ever invented by man: the cross." Today we too can receive peace because of the suffering on the cross--by Jesus our Sacrifice and only Help. Because of the darkness of that experience, and because of the sweet forgiveness and help He offers us right now . . . our entire future can be changed. The cross itself has no power to save anyone, but the Christ that suffered, bled and died on it--can save each of us to the uttermost. No matter what you may have done in the past, what you may be now . . . Come, just now; come to Jesus your Saviour, your Redeemer, your Enabler, your Friend . . . Come to Jesus your Creator and your God. THE HEMATIDROSIS--The bloody sweat that was wrung from His body in the agony of Gethsemane, we now know was to increase greatly His sensitiveness to pain in the terrible hours that were to follow. THE FLAGELLUM--The beating that they gave to Christ in Pilate's judgment hall, till His back was lacerated and quivering - we now know only intensified the pain of every breath that He took upon the cross as He hung there for hours. Why did He hang there for hours? The priests mocked Him and told Him to come down from the cross. He was able to do so. He could have called on angels to take Him from the terrible scene. But He did not do so. He remained there . . . and suffered on . . . for you and for me. THE PATIBULUM--Christ did not have to go through all this agony, for He had done nothing wrong against God or man. But His concern for us was greater than any thought of Himself. Anguish, pain, lack of sleep, three trials, the scourging . 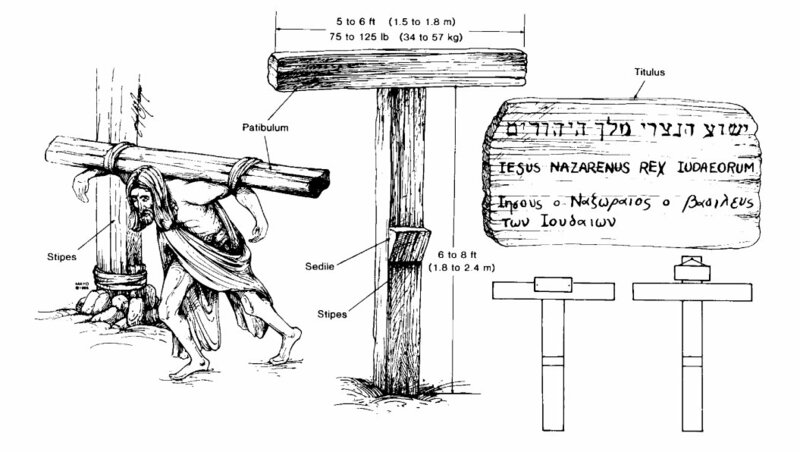 . . and now to carry the cross, or its crossbeam, itself a very heavy load . . . And then He sank beneath that load. He did not have to walk that third of a mile to a cross. Instead, He could have walked out on it all--and gone back to heaven. But He stayed with it, and went through it . . . because of us . . . because of you . . . and me. THE INTERCARPAL, INTERTARSAL NAILING--Now we know that, before the nailing started, they first threw Him down to the ground onto His lacerated back, wet with blood. This would grind dirt into His wounds and itself add greatly to the pain of the cross. THE CRUCIFIXIUM--Not impalatium (fastening to a stake), but crucifixium--(nailing to a cross-beamed post) was to be the lot of our wonderful Lord and Saviour. The crucifixion process was a terrible one. You will read about it in this present study. THE HYPERCARBIA--Prophecy predicted that not a bone of His body would be broken. Yet the hands and feet are filled with bones. We now know that the Romans had learned of a space in each hand and foot where a nail could pass through without breaking a bone--but, in so doing, would injure, inflame, and then rest alongside important nerves, and bring terrible pain throughout the ordeal of the cross. Because the body was suspended from the arms, the only way a breath could be taken was by lifting the body upward--by pushing downward on the nails in the hands and feet. This, in turn, brought intense pain to the median nerve in each hand, and to the peronial and plantar nerves in each foot. In addition, every time the body was raised to catch another breath, the lacerated back would scrape against the rough wood of the cross, tearing open the dirty wounds all the more, and adding to the searing pain. THE EXPIRATIUM--Christ died of a broken heart. Read again our tract, "The Crucifixion," for evidence on this point. He died of cardiac rupture. Our redemption meant that He must be separated from the Father, bear our sin, and die on Calvary. The horror of the separation outweighed the physical suffering. And it slew Him. He endured it all . . . to the end . . . for us. THE CRURIFRAGIUM--Crucifracture, or the breaking of the legs, would hasten death because the crucified ones could no longer rise to catch a breath. But Christ received no broken bones; He was already dead. THE SPEARING--The infantry spear, thrust suddenly into the side of Jesus brought forth blood and water in two distinct streams. Fluid from the stomach mingled with blood from the broken heart . . . flowed forth. All because He loved us too much to let us die the eternal death. He died that we might live with Him forever. THE CRUCIFORM DEATH--In the annals of mankind, there have never been found records of a death more terrible than that of the cross. And yet God's own Son went through all that suffering and agony . . . in order to redeem you from sin, empower you by His grace to obey His Father's laws, and impart to you eternal life at His Second Advent. Come . . . accept Him just now . . . as your Saviour. When taken in concert, certain facts--the extensive and early testimony of both Christian proponents and opponents, and their universal acceptance of Jesus as a true historical figure; the ethic of the gospel writers, and the shortness of the time interval between the events and the extant manuscripts; and the confirmation of the gospel accounts by historians and archaeological findings26,27--ensure a reliable testimony from which a modern medical interpretation of Jesus' death may be made. 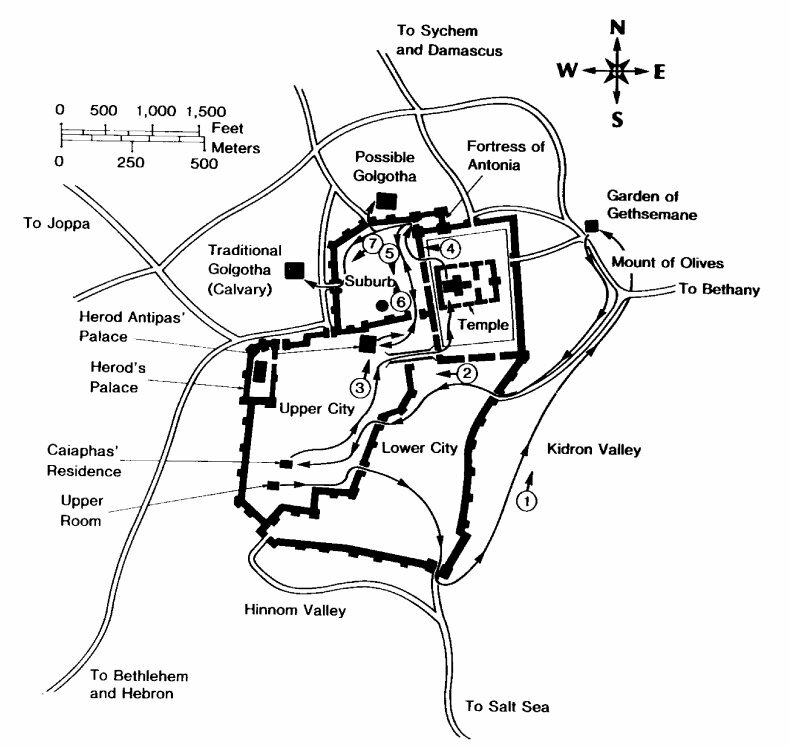 Fig 1.--Map of Jerusalem at the time of Christ. Although this is a very rare phenomenon, bloody sweat (hematidrosis or hemohidrosis) may occur in highly emotional states or in persons with bleeding disorders.18,20 As a result of hemorrhage into the sweat glands, the skin becomes fragile and tender.2,11 Luke's description supports the diagnosis of hematidrosis rather than eccrine chromidrosis (brown or yellow-green sweat) or stigmatization (blood oozing from the palms or elsewhere).18,21 Although some authors have suggested that hematidrosis produce hypovolemia, we agree with Bucklin that Jesus' actual blood loss probably was minimal however, in the cold night air,1 it may have produced chills. The rigors of Jesus ministry (that is, traveling by foot throughout Palestine) would have precluded any major physical illness or a weak general constitution. Accordingly, it is reasonable to assume that Jesus was in good physical condition before his walk to Gethsemane. However, during the 12 hours between 9 PM Thursday and 9 AM Friday, He had suffered great emotional stress (as evidenced by hematidrosis), abandonment by his closest friends (the disciples), and a physical beating (after the first Jewish trial)1. Also, in the setting of a traumatic and sleepless night, he had been forced to walk more than 2.5 miles (4.0 km) to and from the sites of the various trials (Fig 1). These physical and emotional factors may have rendered Jesus particularly vulnerable to the adverse hemodynamic effects of the scourging. Left. Short whip (flagrum) with lead balls and sheep bones tied into leather thongs. Center left. Naked victim tied to flogging post. Deep stripelike lacerations were usually associated with considerable blood loss. Center right. View from above, showing position of lictors. Right. Inferomedial direction of wounds. The severe scourging, with its intense pain and appreciable blood loss, most probably left Jesus in a preshock state. Moreover, hematidrosis had rendered his skin particularly tender. The physical and mental abuse meted out by the Jews and the Romans, as well as lack of food, water and sleep, also contributed to his generally weakened state. 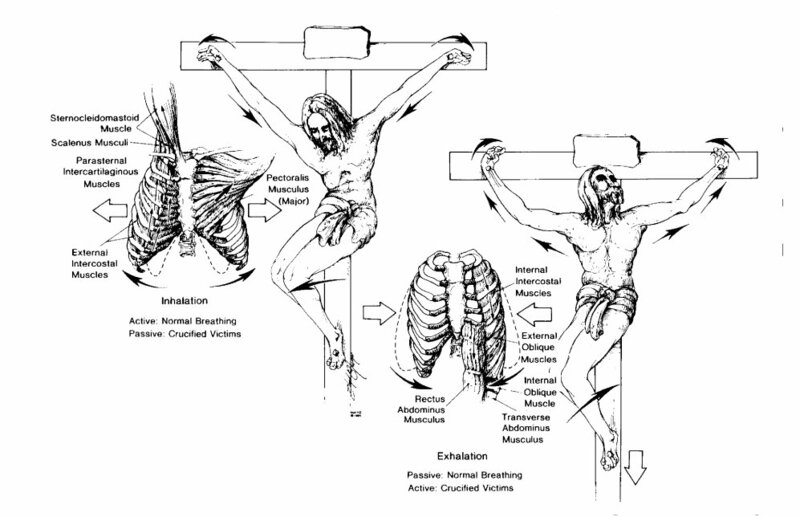 Therefore, even before the actual crucifixion, Jesus' physical condition was at least serious and possibly critical. Left. Victim carrying crossbar (patibulum) to site of upright post (stipes). Center. Low Tau cross (crux commissa). commonly used by Romans at time of Christ. Upper right. Rendition of Jesus' titulus, with name and crime--Jesus of Nazareth, King of the Jews--written in Hebrew, Latin, and Greek. Lower right. Possible methods for attaching titulus to Tau cross (left) and Latin cross (right). Crucifixion probably first began among the Persians.34 Alexander the Great introduced the practice to Egypt and Carthage, and the Romans appear to have learned of it from the Carthaginians.11 Although the Romans did not invent crucifixion, they perfected it as a form of torture and capital punishment that was designed to produce a slow death with maximum pain and suffering.20,27 It was one of the most disgraceful and cruel methods of execution and usually was reserved only for slaves, foreigners, revolutionaries, and the vilest of criminals.3,25,28 Roman law usually protected Roman citizens from crucifixion,5 except perhaps in the case of desertion by soldiers. Left. Size of iron nail. Center. Location of nail in wrist, between carpals and radius. Right. 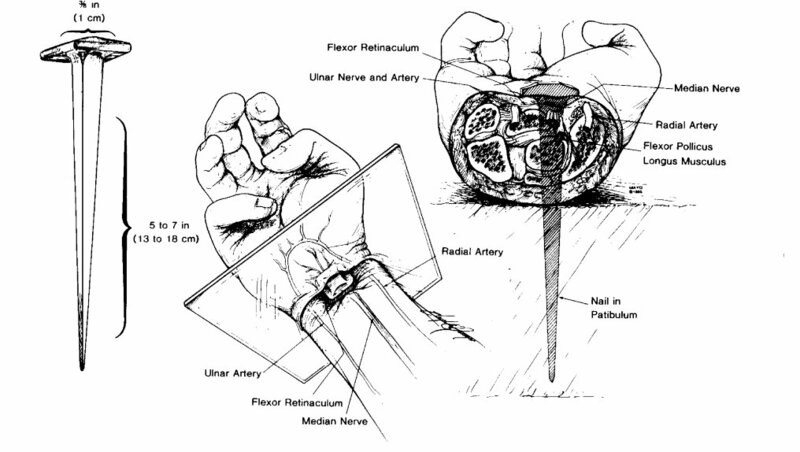 Cross section of wrist, at level of plane indicated at left, showing path of nail, with probable transection of median nerve and impalement of flexor pollicis tongus, but without injury to major arterial trunks and without fractures of bones. Left. Position of feet atop one another and against stipes. Upper right. 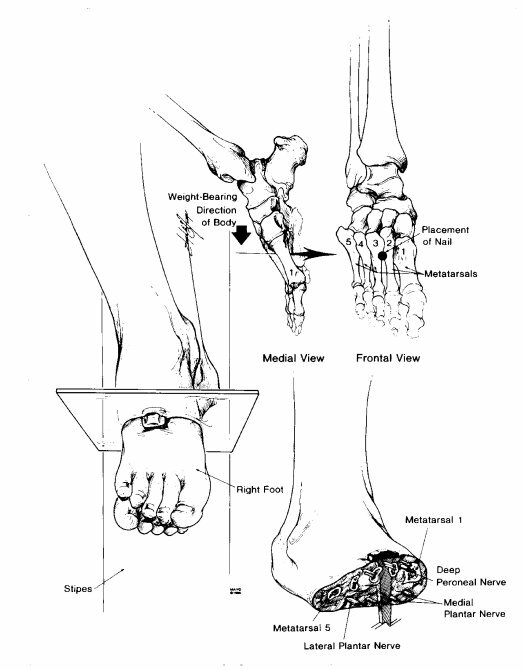 Location of nail in second intermetatarsal space. Lower right. Cross section of foot, at plane indicated at left, showing path of nail. Left. Inhalation. With elbows extended and shoulders abducted, respiratory muscles of inhalation are passively stretched and thorax is expanded. Right. Exhalation. With elbows flexed and shoulders abducted and with weight of body on nailed feet, exhalation is accomplished as an active, rather than passive, process. Breaking legs below the knees would place burden of exhalation on shoulder and arm muscles alone and soon would result in exhaustion and asphyxia. The scourging prior to crucifixion served to weaken the condemned man and, if blood loss was considerable, to produce orthostatic hypotension and even hypovolemic shock.8,12 When the victim was thrown to the ground on his back, in preparation for transfixion of the hands, his scourging wounds most likely would become torn open again and contaminated with dirt.2,16 Furthermore, with each respiration, the painful scourging wounds would be scraped against the rough wood of the stipes.7 As a result, blood loss from the back probably would continue throughout the crucifixion ordeal. With arms outstretched out not taut, the wrists were nailed to the patibulum.7,11 It has been shown that the ligaments and bones of the wrist can support the weight of a body hanging from them, but the palms cannot.11 Accordingly, the iron spikes probably were driven between the radius and the carpals or between the two rows of carpal bones,2,10,11,30 either proximal to or through the strong bandlike flexor retinaculum and the various intercarpal ligaments (Fig 4). Although a nail in either location in the wrist might pass between the bony elements and thereby produce no fractures, the likelihood of painful periosteal injury would seem great. Furthermore, the driven nail would crush or sever the rather large sensorimotor median nerve (Fig 4).2,7,11 The stimulated nerve would produce excruciating bolts of fiery pain in both arms.7,9 Although the severed median nerve would result in paralysis of a portion of the hand, ischemic contractures and impalement of various ligaments by the iron spike might produce a clawlike grasp. The actual cause of death by crucifixion was multifactorial and varied somewhat with each case, but the two most prominent causes probably were hypovolemic shock and exhaustion asphyxia.2,3,7,10 Other possible contributing factors included dehydration,7,16 stress-induced arrhythmias,3 and congestive heart failure with the rapid accumulation of pericardial and perhaps pleural effusions.2,7,11 Crucifracture (breaking the legs below the knees), if performed, led to an asphyxic death within minutes.11 Death by crucifixion was, in every sense of the word, excruciating (Latin, excruciatus, or "out of the cross"). After the scourging and the mocking, at about 9 AM, the Roman soldiers put Jesus' clothes back on him and then led him and two thieves to be crucified.1 Jesus apparently was so weakened by the severe flogging that he could not carry the patibulum from the Praetorium to the site of crucifixion one third of a mile (600 to 650 m) away.1,3,5,7 Simon of Cyrene was summoned to carry Christ's cross, and the processional then made its way to Golgotha (or Calvary), an established crucifixion site. The gospel of John describes the piercing of Jesus' side and emphasizes the sudden flow of blood and water.1 Some authors have interpreted the flow of water to be ascites12 or urine, from an abdominal midline perforation of the bladder.15 However, the Greek word, pleura,12,13,36 used by John clearly denoted laterality and often implied the ribs.6,12,16 Therefore, it seems probable that the wound was in the thorax and well away from the abdominal midline. Although the side of the wound was not designated by John, it traditionally has been depicted on the right side.4 Supporting this tradition is the fact that a large flow of blood would be more likely with a perforation of the distended and thin-walled right atrium or ventricle than the thick-walled and contracted left ventricle. Although the side of the' wound may never be established with certainty, the right seems more probable than the left. Some of the skepticism in accepting John's description has arisen from the difficulty in explaining, with medical accuracy, the flow of both blood and water. Part of this difficulty has been based on the assumption that the blood appeared first, then the water. However, in the ancient Greek, the order of words generally denoted prominence and not necessarily a time sequence.17 Therefore, it seems likely that John was emphasizing the prominence of blood rather than its prominence preceding the water. Fig 7.--Spear wound to chest. Left. Probable path of spear. Right. Cross section of thorax, at level of plane indicated at left, showing structures perforated by spear. LA indicates left atrium; LV. left ventricle; RA. right atrium: RV. right ventricle. However, another explanation may be more likely. Jesus' death may have been hastened simply by his state of exhaustion and by the severity of the scourging with its resultant blood loss and preshock state.7 The fact that he could not carry his patibulum supports this interpretation. The actual cause of Jesus' death, like that of other crucified victims, may have been multifactorial and related primarily to hypovolemic shock, exhaustion asphyxia, and perhaps acute heart failure.2,3,5,7,10,11 A fatal cardiac arrhythmia may have accounted for the apparent catastrophic terminal event. Thus, it remains unsettled whether Jesus died of cardiac rupture or of cardiorespiratory failure. However, the important feature may be not how he died but rather whether he died. 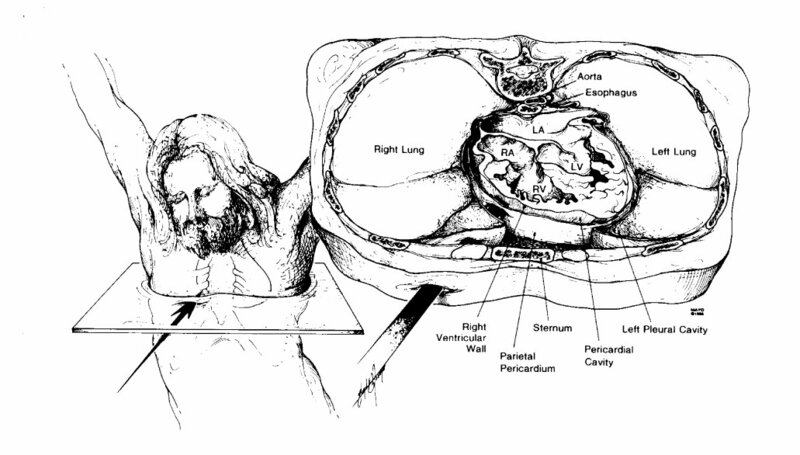 Clearly, the weight of historical and medical evidence indicates that Jesus was dead before the wound to his side was inflicted and supports the traditional view that the spear, thrust between his right ribs, probably perforated not only the right lung but also the pericardium and heart and thereby ensured his death (Fig 7). Accordingly, interpretations based on the assumption that Jesus did not die on the cross appear to be at odds with modern medical knowledge. 2. Lumpkin R: The physical suffering of Christ. J Med. Assoc Ala 1978,47:8-10,47. 19. Sutton RL Jr: Diseases of the Skin, ed 11. st Louis, CV Mosby Co. 1956, pp 1393-1394. 36. Brown F. Driver SR, Briggs CA: A Hebrew and English Lexicon of the Old Testament With an Appendix Containing the Biblical Aramaic. Oxford, England, Clarendon Press, 1953, pp 841, 854. 3 Johnson CD: Medical and cardiological aspects of the passion and crucifixion of Jesus, the Christ. Bol Assoc. Med. PR 1978;70:97-102. 20. Scott CT: A case of haematidrosis. Br Med. J 1918;1:532-533. 37. Robertson AT: A Grammar of the Greek New Testament in Light of Historical Research. Nashville, Tenn, Broadman Press, 1931, pp 417-427. 4. Barb AA: The wound in Christ's side. J Warburg Courtauld Inst. 1971;34:320-321. 21. Klauder JV: Stigmatization. Arch DermatoI Syphilol 1938;37:650-659. .38. Jackson SM (ed): The New Schaff-Herzog Encyclopedia of Religious Knowledge. New York, Funk & Wagnalls, 1909, pp 312-314..
5. Bucklin R The legal and medical aspects of the trial and death of Christ. Sci Law 1970; 10:14-26. 22. Weaver KF: The mystery of the shroud. Natl Geogr 1980;157:730-753. 39. Kim H-S, Suzuki M, Lie JT, et al: Nonbacterial thrombotic endocarditis (NBTE) and dis-seminated intravascular coagulation (DIC): Autopsy study of 36 patients. Arch Pathol Lab Med 1977;101:65-68. 6. Mikulicz-Radeeki FV: The chest wound in the crucified Christ. Med News 1966;14:30-40. 23. Tzaferis V: Jewish tombs at and near Giv'at ha-Mivtar, Jerusalem. Israel Explor J 1970;20:18-32. 40. Becker AE, van Mantgem J-P: Cardiac tamponade: A study of 50 hearts. Eur J Cardiol 1975;3:349-358. 7. Davis CT: The crucifixion of Jesus: The passion of Christ from a medical point of view. Ariz Med 1965;22:183-187. 24. Haas N: Anthropological observations on the skeletal remains from Giv'at ha-Mivtar. Israel Explor J 1970;20:38-59. 8. Tenney SM: On death by crucifixion Am Heart J 1964;68:286-287. 25. McDowell J: The Resurrection Factor. San Bernardino, Calif, Here's Life Publishers, 1981 pp 20-53, 75-103. 9. Bloomquist ER: A doctor looks at crucifixion. Christian Herald, March 1964, pp 35, 46-48. 26. McDowell J: Evidence That Demands a Verdict: Historical Evidences for the Chnstian Faith. San Bernardino, Calif, Here's Life Publishers, 1979, pp 39-87, 141-263. 10. DePasquale NP, Burch GE: Death by crucifixion. Am Heart J 1963;66:434-435. 27. McDowell J: More Than a Carpenter. Wheaton, III, Tyndale House Publishers, 1977 pp 36-71, 89-100. 11. Barbet P: A Doctor at Calvary: The Passion of Out Lold Jesus Christ as Described by a Surgeon, Earl of Wicklow (trans) Garden City, NY, Doubleday Image Books 1953, pp 12-18 37-147, 159-175, 187-208. 28. Hengel M: Crucifixion in the Ancient World and the Folly of the Message of the Cross Bowden J (trans). Philadelphia, Fortress Press, 1977, pp 22-45, 86-90. 12. Primrose WB: A surgeon looks at the crucifixion. Hibbert J. 1949, pp 382-388. 29. Ricciotti G: The Life of Christ, Zizzamia AI (trans). Milwaukee, Bruce Publishing Co 1947, pp 29-57, 78-153, 161-167, 586-647. 13. Bergsma S: Did Jesus die of a broken heart? Calvin Forum 1948;14:163-167. 30. Pfeiffer CF, Vos HF, Rea J (eds): Wycliffe Bible Encyclopedia. Chicago, Moody Press, 1975 pp 149-152, 404-405, 713-723, 1173-1174, 1520-1523. 14. Whitaker JR: The physical cause of the death of our Lord. Cath Manchester Guard 1937;15:83-91 . 31. Greenleaf S: An Examination of the Testimony of the Four Evangelists by the Rules of Evidence Administered in the Courts of Justice. Grand Rapids, Mich, Baker Book House, 1965, p29. 15. Clark CCP: What was the physical cause of the death of Jesus Christ? Med Rec 1890;38:543. 32. Hatch E, Redpath HA: A Concordance to the Septuagint and the Other Greek Versions of the Old Testament (Including the Apocryphal Books). Graz, Austria, Akademische Druce U Verlagsanstalt, 1975, p 1142. 16. Cooper HC: The agony of death by crucifixion. NY Med J 1883;38:150-153. 33. Wuest KS: Wuest Word Studies From the Greek New Testament for the English Reader Grand Rapids, Mich, WB Eerdmans Publisher 1973, vol 1, p 280. From the Departments of Pathology (Dr. Edwards) and Medical Graphics (Mr. Hosmer), Mayo Clinic, Rochester, Minn; and the Homestead United Methodist Church, Rochester, Minn, and the West Bethel United Methodist Church, Bethel, Minn (Pastor Gabel). Reprint requests to: Department of Pathology, Mayo Clinic, Rochester, MN 55905 (Dr. Edwards).Reprinted from the JAMA� Journal of the American Medical Association March 21, 1986, Volume 225 Copyright 1986, American Medical Association.